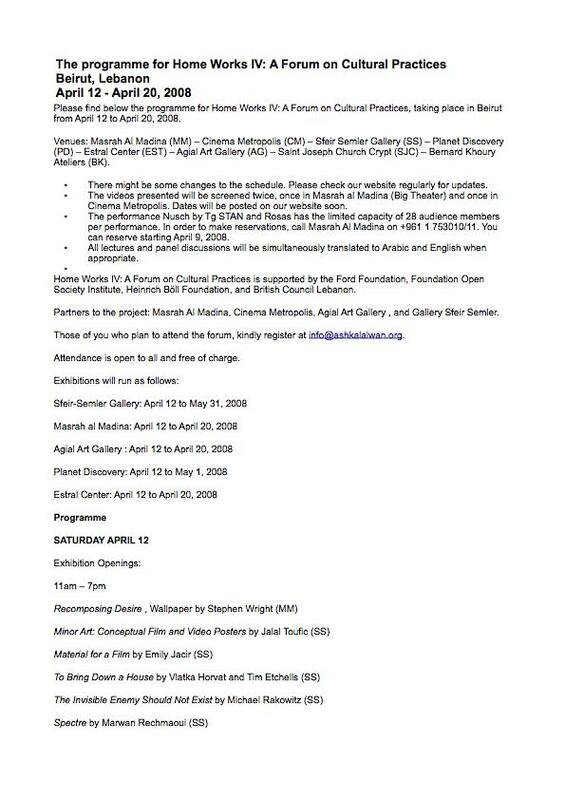 Home Works IV: A Forum on Cultural Practices, to be held in Beirut, Lebanon, April 12-20, will feature Let It Be, a film and video program curated by Akram Zaatari that will include "Kangaroo" (1998), "Cul en l'air" (1997), "Point P" (2000, premier), Model (2001) and "My Hands Are Shaking" (2001), along with works by Rodney Werden, Nathalie Djurberg, Sterling Ruby, Pierrick Sorin, Hans Peter Ammann, Naufus Figuera, Nelson Henricks and John Lindell. Let it Be will be screened at Masrah Al Madina, Wednesday, April 16 (10pm), and at Bernard Khoury Ateliers, Friday, April 18 (10:30pm). "Kangaroo" , "Cul en l'air" , "Point P" ,Model , "My Hands Are Shaking"
“Let It Be, a program curated by Akram Zaatari, Beirut, Lebanon,” Pierre Yves Clouin, accessed April 23, 2019, http://pierreyvesclouin.fr/items/show/301.